If you've played NetEnt's classic jewel-themed Starburst slot, you'll know how much developers love a bit of simplicity from time to time. This is particularly true in the burgeoning mobile slots market where the simpler the graphics and gameplay, the easier the slots will work on a wider range of mobiles, and they're better for a quick few spins in between train stops too. 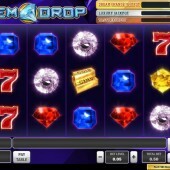 Taking on the jewel vibe, and racking up the progressive jackpots, is the new(ish) Gem Drop slot from Play'n Go, which - if the online version is anything to go by - should prove a winner for players everywhere. The game is a fairly basic 5 reeler, with 10 fixed pay-lines on show. In terms of symbols, we get Gold Bars, a Red 7, plus six different types of jewel. The white diamond is the game's Wild, substituting for all symbols other than the Scatter. As with some of Play'n Go's newer online slots you can gamble after a win, with a Double Up and Triple Up option on offer. Look Out for the Squares! When you see the reels rimmed with gold and a sound effect go off, the reels will spin. Look out for the pale reels that 'sit' on top of the main reels. If these squares come to a stop on the main reels, whichever symbols they cover will turn into Wild and stay in place for a re-spin. That's pretty much it for bonus features - if you can call a Wild and re-spin a feature - but there are some big progressives to aim for. 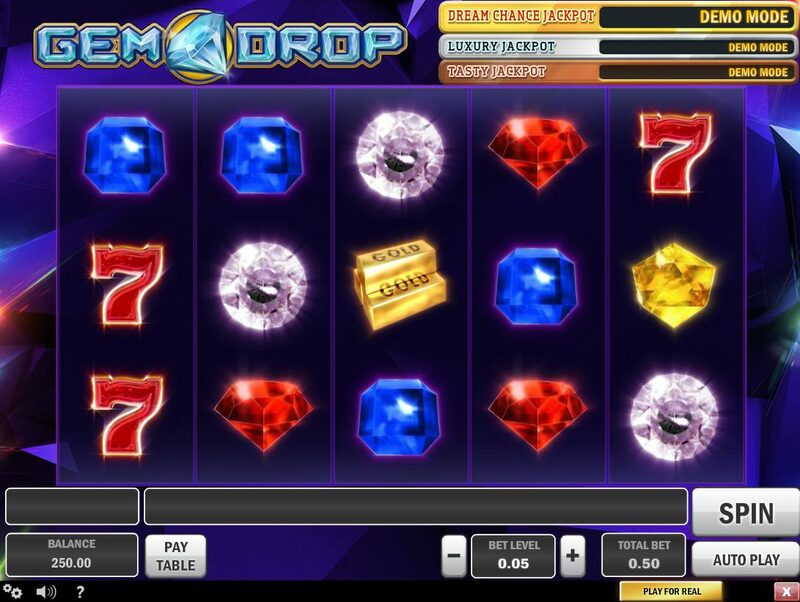 Gem Drop is part of Play'n Go's Dream Chance Jackpot cluster of online slots, with three chances at a lovely progressive up for grabs. Check out the edges of the symbols as some of them will contain gold rings with stars - if you land three, four or five of these on the reels you will trigger the bonus feature that gives you a chance at the big prize. Three gold rings activates the Bronze wheel of fortune. Spin this and you can win the Tasty Jackpot or move on to the Silver Wheel. Four gold rings sends you straight to the silver wheel where you can win the Luxury Jackpot or a chance to move onto the third and best progressive. Finally, five gold rings gives you the chance of spinning the gold wheel of fortune and taking a shot at the Dream Chance Jackpot, which could be in the tens of thousands of dollars bracket. Gem Drop is simple, and that may be enough for some players, but probably not this reviewer. If you're like me and want to access the Play'n Go jackpots but have a little more meat with your potatoes, check out the developer's Wild West-themed Cowboy Treasure slot, while the classic-style Fruit Bonanza is a real treat.